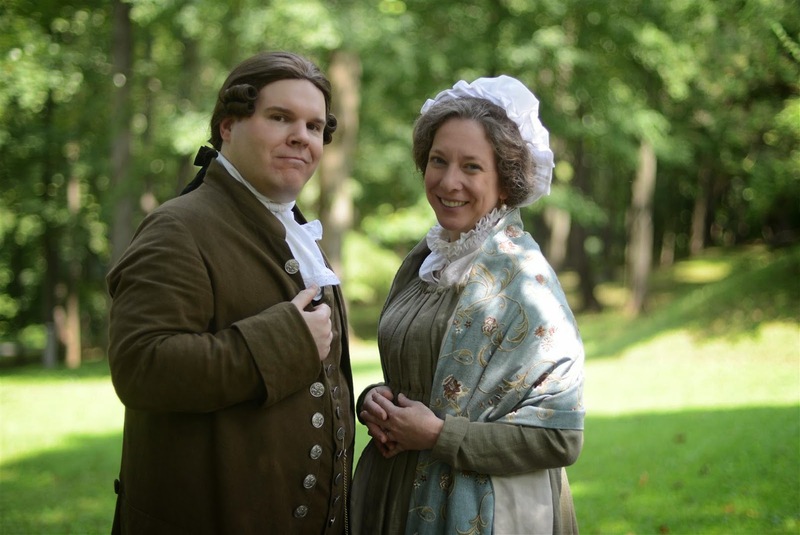 Meet John and Abigail Adams - October 12, 2014 ~ The History Girl! The Jacobus Vanderveer House, once the headquarters of General Henry Knox during the American Revolution, will be open for tours on Saturday, October 11, 2014 from 10:00 am - 5:00 pm and Sunday, October 12, 2014 from 12:00 noon - 4:00 pm during Somerset County’s 9th Annual Weekend Journey Through the Past. Sunday will include include guest appearances by John and Abigail Adams from 2:00 - 3:00 pm. Abigail and John Adams, portrayed by Kim Hanley and Peyton Dixon of the American Historical Theatre, Philadelphia. Photo courtesy of The American Historical Theatre. On Sunday, visitors to the Jacobus Vanderveer House will be transported back to year 1790 as re-enactors portraying John and Abigail Adams recount major events in their lives during the birth of our nation. John and Abigail Adams were active in American politics for most of their married lives. Their four children grew up during the Revolution and were beginning careers and families of their own. The Adams wanted their nation to remain independent and their children to hold responsible places in its future. Their spirited dialogue will offer unique insight into the couple’s keen minds and loving bond. John Adams will be played by Peyton Dixon and Abigail Adams by Kim Hanley, actors affiliated with the American Historical Theatre in Philadelphia. Admission to the presentation is free, but space is limited. To reserve a seat in advance, visit: http://jvanderveerhouse.givezooks.com/events/a-visit-with-john-and-abigail-adams or call 908-396-6053. Tours of the Jacobus Vanderveer House throughout the weekend are free. For more information, visit www.jvanderveerhouse.org. The Jacobus Vanderveer House is located at 3055 River Road (in Bedminster’s River Road Park), Bedminster, NJ 07921. Somerset County’s 9th Annual Weekend Journey through the Past, is an opportunity to step back in time and visit 26 historic sites countywide, which are open free to the public on Saturday, October 11, from 10:00 am - 5:00 pm and Sunday, October 12, from 12:00 noon - 4:00 pm. The annual autumn weekend features interpreted tours led by costumed docents; special collections and exhibitions; period military drills and encampments by living-history re-enactors; open-hearth cooking; colonial tavern life and games; and much more. For more information about Weekend Journey Through the Past visit: www.co.somerset.nj.us/schistoryweekend.